Tired of waiting through another long hiatus between seasons of Doctor Who? No problem! Titan Comics has you covered. Continuing the tales of the current Thirteenth Doctor, this collection brings together the first four issues of the new comic series. Featuring the Thirteenth Doctor and her current TV companions Yaz, Ryan, and Graham, this story takes the Doctor and her team through time, space, and into the face of evil itself. While the Doctor is showing her trusty companions the beauty of a sentient nebula, a strange figure phases into their view and then vanishes. As they chase this person through time and space, they discover a sinister plot and a new villain to challenge. This is a very entertaining story with spot-on dialogue and great characterization. Jody Houser is able to transfer the Doctor from the TV screen and seamlessly put her on the page. Whovians even get a “Geronimo” out of the new Doctor (for Matt Smith fans)! This collection of the first four issues not only will help fans through the long period between seasons, but it is also very good at introducing the Doctor to potential new Whovians. Fans that love the Doctor and readers that have never heard of Doctor Who can both pick up this comic and enjoy it from cover to cover. This is a flat-out fun read! 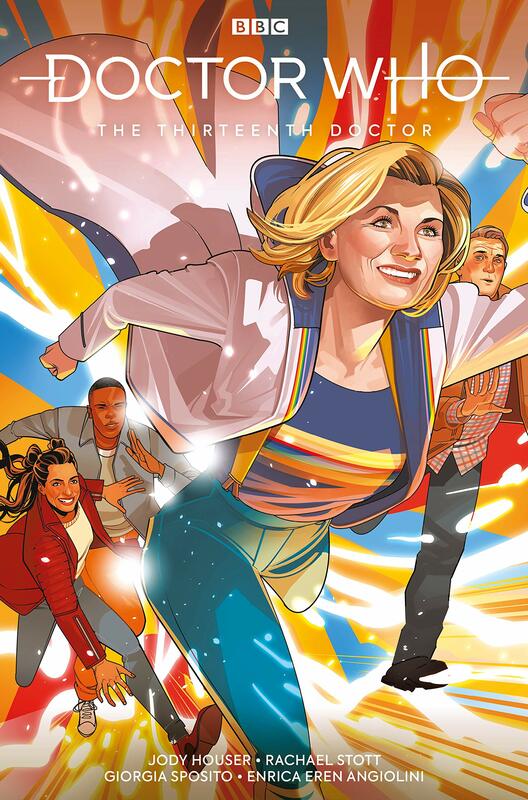 With fantastic artwork, a fascinating story, and plenty of action, this comic will fill the TARDIS-shaped hole in your life until the new season arrives. Rating: 10 out of 10. As the 9th Doctor would say: Absolutely Fantastic!